Monday morning was probably our slowest morning of the trip. 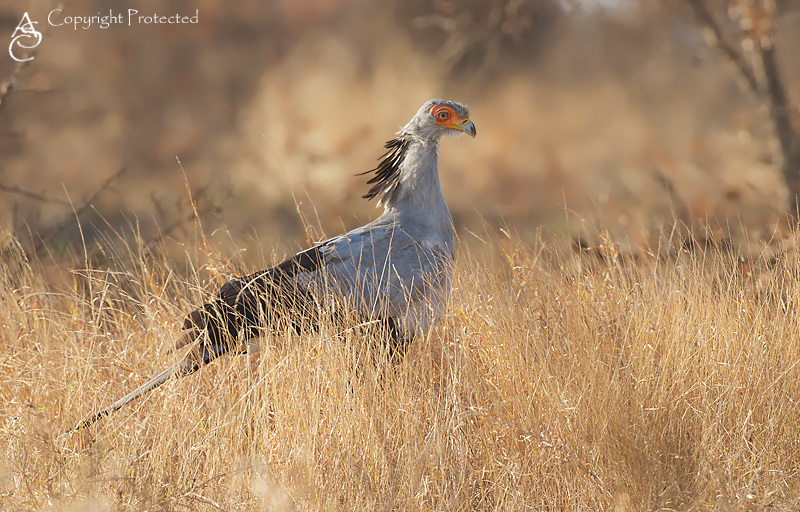 Our first good sighting was only just before 8 am, of a Secretary bird hunting in the grass. 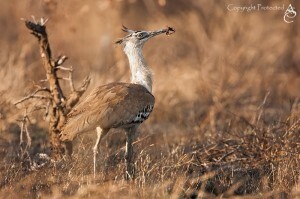 Shortly after the Secretary bird, we saw a group of 6 Kori Bustards, walking through grass, hunting and interacting. Unfortunately, the light was already getting harsh by then and getting good shots was hard. However, seeing these endangered birds is always a treat, and seeing how one tried to steel another’s scorpion breakfast was very interesting. 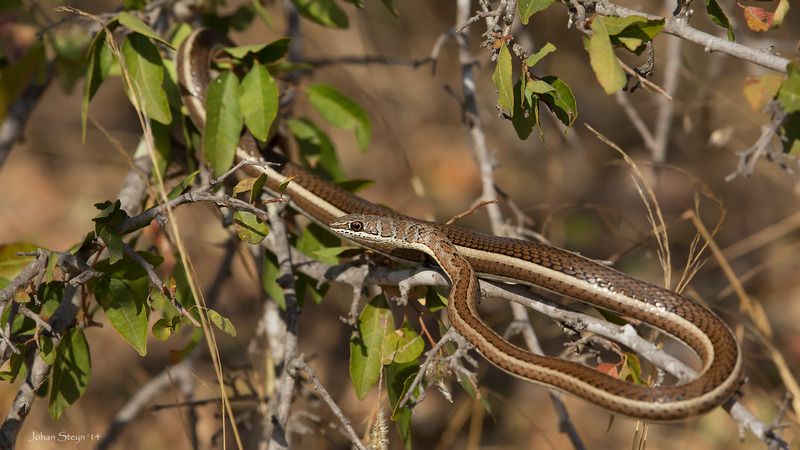 We stopped at the Ratelpan hide again, where we saw a lone heron among the crocodiles, before stopping at the Timbavati picnic site for a breakfast of muffins and coffee – there was far too much wind to attempt making bacon and eggs on a gas skottel. After breakfast we took the S39 Timbavati river road, where our first sighting was of s Spotted Skaapsteker lurking in a bush. We idled slowly along the S39, doing a bit of birding (and identifying at least one new specie – the Rufous Winged Cisticola). Turning another of the many corners on this road, we saw a huge herd of buffalo grazing on the right side of the road. As we sat watching them, an anti-poaching chopper hovering a small distance away suddenly spooked them, and the entire herd stampeded across the road, both in front of and behind the car. Being in the middle of a stampeding herd of several hundred Buffalo is not an experience that will soon be forgotten! 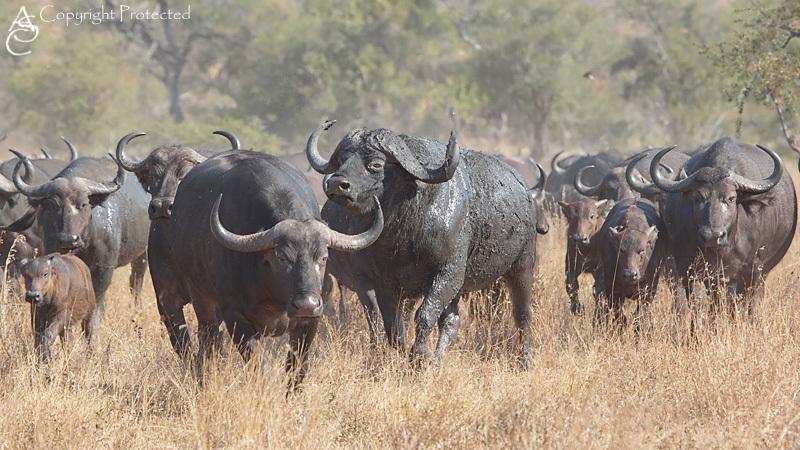 Still full of adrenaline from the Buffalo stampede, we drove towards the H7 and turned left, back towards the camp. One the way back we identified another new bird specie – the Senegal Lapwing. Beyond that and the usual hippos at the Nsemani dam, we didn’t see much. 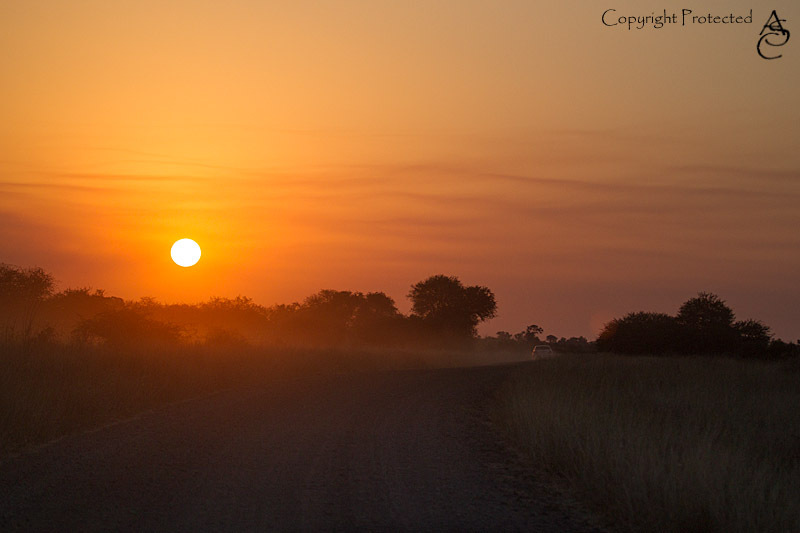 That afternoon, we did the S100 again, and but saw very little, apart from spectacular amounts of dust, resulting in an even more spectacular sunset. 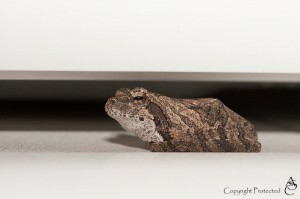 On our first night in Satara, we found a tiny little Southern Foam Nest Frog on top of the bathroom door. Afraid that we might squash it, we gently caught it and placed it on the tree in front of the bungalow. 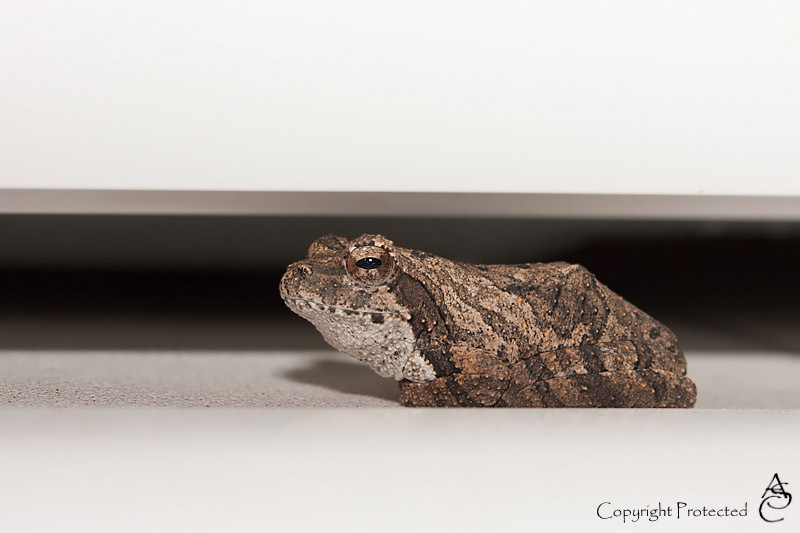 Soon after, we started worrying that something might catch it out there, so we were very happy to find out the next day that it had returned and moved in under the microwave oven on top of the fridge outside the bungalow. It lived there for the duration of our stay, moving out from the microwave when the sun set, and moving back in, deeper under the microwave when the sun came up in the morning. On the last day of our trip, I decided that I simply had to immortalize our little house guest, so I fetched my macro lens and flash, and photographed it. We really hope the little guy is still ok!